"The New Hong Kong Competition Law: Anomalies and Challenges"
Abstract: Enacted in 2012, the Hong Kong Competition Ordinance represents the first cross-sector competition legislation governing the Hong Kong Special Administrative Region. 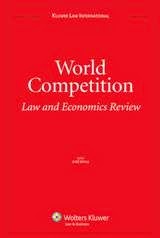 This article critically evaluates the peculiar aspects of the Competition Ordinance with reference to the legislative history as well as the competition law and enforcement experience of foreign jurisdictions (such as the European Union, the United States, and Australia). These aspects include: (i) the lack of cross-sector merger control; (ii) the ‘substantial market power’ requirement under the second conduct rule; (iii) the ‘object or effect’ test under the second conduct rule; (iv) the blanket exclusion of statutory bodies; (v) the power of the Chief Executive in Council to disapply the competition rules; (vi) the turnover de minimis thresholds; (vii) warning notices; (viii) the judicial enforcement model and restrictive private actions; and (ix) the capping of fines at 10% of local turnover. This article discusses solutions to some of these problems, and the challenges ahead for competition law enforcement in Hong Kong. Click here to download the article.